Today we had the privileged of celebrating the cutest three year old I know! My sweet Judah turns three on Monday and today we threw him a super fun pool party! Look at this picture of him. He is one of the silliest yet sweetest, most "huggable-est" kids I know! So, very doable and cute. :) And, yes, those nutterbutter creatures are supposed to be Hippos. I at first thought, camels but it just didn't fit the theme "Jungle Fever"! Ha! The Fruit Loop nostrils help a bit with the hippo factor but, eh, aren't hippos grayish-pinkish? Or purple-ish? Well, they were yummy anyway! Here is my finished product which I set up super quick, took a few shots then put back in the fridge (topmost layer) as my candy melt flamingos were heat sensitive. I've worked with candy melts before and they are awesome--you can do lots and lots with them BUT their one major flaw can be found in their name Candy MELTS. They melt, rather quickly in the Texas heat. SO, to the fridge the went until cake time and then we all had fun watching their wings slowly droop and a few of their heads drop off. Lol! I loved how some of the Fruit Loops on the alligators' eyes were different shapes so that some of them look like they were winking at you! 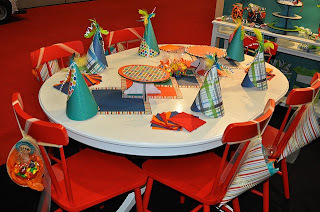 Those party favor cones were so cute yet SO simple! Here is what I came up with using a paper line by The Paper Studio called "A Boys Universe". You can click on the photo for a more upclose shot! I had fun using Spellbinder's Sprightly Sprockets nestabilities (love these!) to create the thank you panel and Gina K Design's "Framed Greetings" stamp set for the Thank You sentiment. Also, one of my favorite things about these cuties is the fun orange and white striped ribbon I used to hang them with. You can't see it all that well in this pic but you can see a bit of it. What a lot of fun projects - I hope you were well enough to enjoy the fun as well! What a cute little guy and your projects are fantastic! Haha. The best part about this post (other than your little cutie! ), was that you called those cupcakes, "easy." I almost died. "Easy" to me = ordered at HEB or something. "Easy" in your book = absolutely fantastic and effortless looking! Great job! Oh my gosh....what a lot of work...but OH SO stinkin' cute!!! So is your little guy!!! Love the cupcakes - so adorable!!!! And congradulations!!!! - I hadn't heard you were expecting - sending you lots and lots of Blessings!!! !